We’d love your help. Let us know what’s wrong with this preview of Words Into Type, 3rd Edition by Marjorie E. Skillin. 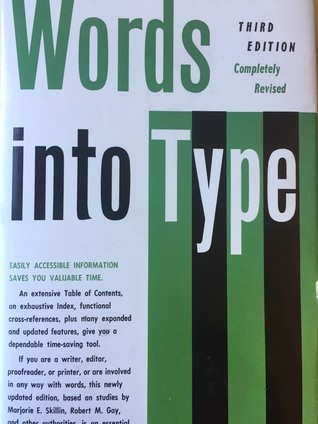 In the years since its first publication, 'Words into Type' has become a classic among style manuals, an invaluable reference source for many of the fine points of grammar, usage, style, and production methods. The third edition of 'Words into Type' provides an overview of the many processes of transforming the written word into type - from the preparation of the copy to t In the years since its first publication, 'Words into Type' has become a classic among style manuals, an invaluable reference source for many of the fine points of grammar, usage, style, and production methods. The third edition of 'Words into Type' provides an overview of the many processes of transforming the written word into type - from the preparation of the copy to the market-ready work. To ask other readers questions about Words Into Type, 3rd Edition, please sign up. Although this book was written at a time when type writers were prevalent the information presented about how to present a manuscript, copy and proofing, copy editing, etc... are still very much relevant and important even if you are going to self-publish. Best written and organized style book I ever used. Not something you'd want to sit down and read all the way through, but a good reference. It would be nice if there were a new edition that mentioned computers - some of the sections were laughably archaic. I'm not a copy editor, but this book has been my go to style manual for years. What trite expressions should you be avoiding? Pages 411 - 415. If you need to know anything about using words, this is the book. One of the definitive guides to editorial production. Read the parts that interested me, which was basically the list of prepositional collocations. Hands-down the most helpful reference guide.